Today’s new lawsuit filing challenges ban on safest, most common method in second trimester abortion Let me start by saying, here we go again. One year after our historic Whole Woman’s Health victory, we find ourselves filing the second post HB2 lawsuit we have had to file in less than a year’s time. It is absurd, that even in the wake of our powerful SCOTUS victory, we had a Texas legislative session this year where politicians introduced more than 45 bills to try and further restrict women’s access to abortion care. And if that wasn’t enough, Texas politicians are amid a Special Session of the legislature right now where many additional bills are on the docket. It seems that bigoted, anti-woman, aggressive politicians will stop at nothing these days. Frankly, it is shocking and I know many of you share my commitment to resistance. This can never become normal; we must all stay shocked. 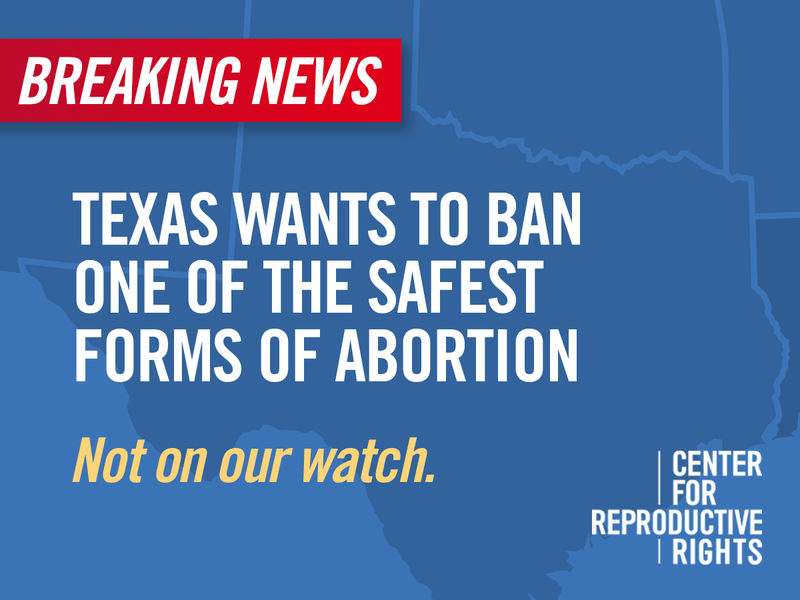 When Senate Bill 8 passed into law in Texas, women were faced with yet another attempt by politicians to undermine our equality and try to control our bodies by restricting our constitutional right to safe abortion care. Let’s be clear, politicians, not doctors, are pushing for these restrictions, and they undermine the ability of health care professionals like Whole Woman’s Health to provide the individualized care that’s right for each of our patients. Doctors and major medical groups like ACOG all oppose this ban; and of course they do, it is a law that makes it illegal for doctors to use their expertise to do what is right for the women they serve. This threatens the safety of women, and punishes doctors for using their best medical judgment. Today I say, enough is enough Texas. Whole Woman’s Health clinics are here to stay and we will continue to fight for the women we serve. Access to safe abortion care is a human rights issue; reproductive freedom for women is about equality, self-determination and autonomy. We cannot let our opposition try to say it is otherwise or pretend that they have our best interests in mind. Our dignity, and our very lives are at stake, and Whole Woman’s Health is here to step up once again for Texans. We are not going to accept these attacks as our new normal. We will never agree to sit idly by, allowing Texas politicians, who don’t care about women’s rights and autonomy, determine how and when we make our own private and personal decisions. Whole Woman’s Health is honored to lead another fight in the courts for we firmly believe that all of us are lifted up when the women in our communities have true and full equality. Read the official filing for Whole Woman’s Health v. Paxton.